We’ve known for a while that online marketing strategies should focus on specific groups of people to be effective, but it seems that marketers are on overdrive at the moment, churning out content after content talking about targeting the right audience and the right buyers. It’s dizzying. In all fairness, I understand why they are writing about it! Mobile browsing behavior has changed the way we buy. As small business owners, we need to adapt. Google research shows that 1 out of 3 users have bought from a brand other than they intended to because of the information they provided was useful at the moment they needed it. This translates into a 30% chance at stealing a client from another competitor. Well, that shakes things up, and it’s great news for the smaller business trying to compete against the huge corporations. So the question then becomes, how can I create the most useful information for my buyer’s. That’s where buyer persona’s come in. The better a company understands its potential buyers, the higher the chances are that they will increase their customer base. If you’ve got a large clientele, you can just ask your clients what they find most useful. The very act of asking them what they care about may even help with client retention, but what do you do if you are starting out or don’t have that many clients? 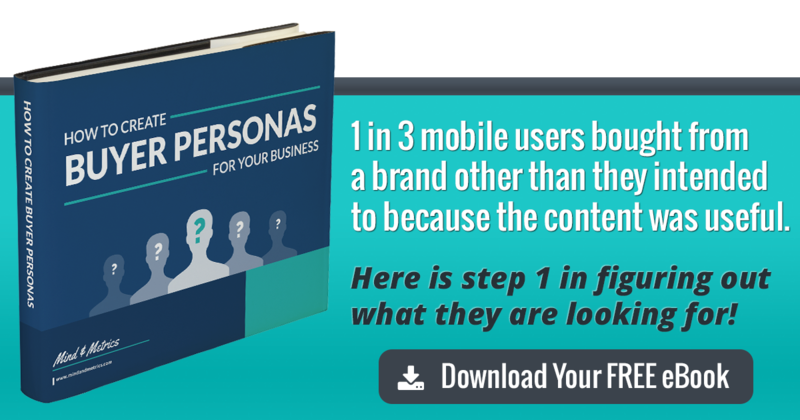 This is where most small business owners give up on their buyer personas. It seems odd to make up fictitious characters in your head, let alone write them down on paper. People get stuck on the blank page and then decide to move on to actually running their business, which seems more important at the time and infinitely more fun. However, skipping the buyer persona creation phase has consequences. Take a look at how we consulted one of our clients to understand why buyer personas are so important. Our client was a former HR executive that started her own business as a life coach. Her network consisted of young business executives, and she wanted to advertise her two-day Weekend Self-Confidence Building Seminar on Facebook. Before she launched her ad, she wanted to get feedback on her taglines. Discover the power of self-confidence! Which one would you pick? And if you saw this ad on your Facebook feed would you want to click to learn more? Don’t feel bad if you can’t pick one. None of them have enough impact to break through the clutter. We all know that self-confidence is a good thing, but neither one of these ads explained who the ad was for and how life-coaching would help them. Without having set up buyer persona’s, it’s easy to miss these details. When you set up buyer persona’s correctly, you’ll know what your potential customer’s pain points are. What their goals and challenges are. And how you can uniquely position yourself to allow them to achieve their goals. You can then craft messaging that speaks to their needs. “Fundamental Assumptions” are assumptions that aren’t based on factual data; they’re intended to get you started and are often based on a hunch or gut feeling. They are guesstimated to the best of our ability and need to be refined later on, but they serve a purpose to get you started. Marking your buyer’s personas as “Fundamental Assumptions” will remind you that the data is not tried and tested. Once you have built up your customer base, you can come back and refine them (or even scrap those that were completely off the mark). By creating our buyer personas with our client, we identified a common thread amongst them, namely to be more successful at work, to be respected more and to shake performance anxiety. Boost your self-confidence and never fear public speaking again. Reclaim your confidence and become an influencer at work. Discover the power of self-confidence and rule the boardroom. The first tagline was created to attract the largest group of people. The fear of public speaking is a common problem for young business executives that are starting out leading presentations for their business meeting, but it’s also a common problem for people beyond the targeted demographic. The second tagline was created to target those ambitious executives that were looking to move up on the career ladder, and the third tagline was intended to target business executives that were under the pressures of boardroom situations. These are by no means the end all of the taglines. They are after all based on fundamental assumptions and not facts. The more factual and data-driven you can be about your buyer persona’s the more accurate they’ll be. In return, allowing you to craft more effective marketing messages. Both our client and ourselves believed that these taglines would perform better than the first tag lines. Just by creating even the most basic buyer persona for our client, we were able to refine her taglines and give them more focus. Go ahead, try! When you go through the same process, you’ll create brand messaging that cuts through the marketing clutter.